In his sculptural works, Iz Maglow often deals with topics with which he also deals with in his paintings at the same time. The three-dimensional works can be divided into three groups: Small Sculptures ("Silent Witnesses"), which are coated with a layer of paint, Art Objects that directly or indirectly "articulate space" with everyday objects and Tempo Art, which deals with the object and the literal sense of the paper tissue with the name "Tempo". "Silent Witnesses" are what Iz Maglow calls the presentation of sculptures that sometimes deal with typical "vis à vis situations". Silent Witnesses (1989 - 1990) stand for wooded sculptures that have been covered with many layers of color glazes and present themselves under a structurally rich, sculptural skin. Some works also play with different light effects and reflections through the use of glass elements. Titles such as "Maria col Bambino" or "Venus with the Mirror" show the closeness of these sculptures to Maglow's painting series "Annunciation" or "Homage to Velazquez". 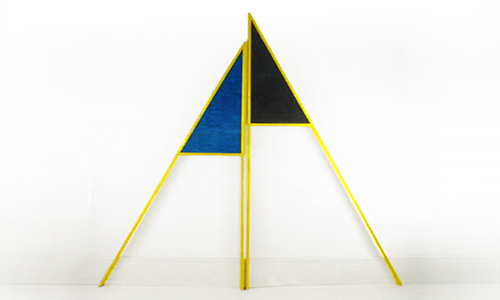 In his exploration of Chairs (1989 - 1991), Iz Maglow returns with these wall objects. He shows relief-like art objects that reinterpret the chair as a perspective object, but also as a sign or "cipher". The "chair" as an object of particular attention, especially with regard to "vis à vis situations", has already fascinated the artist in his stage sets (for example: "La Voix Humaine"). Color Constructs (1983) are painted scaffolding structures that thematise water and flowing, which are underlined by titles such as "Small Waterfall", "Torrent" or "La Mer". The structures of wood and partly of plastic originated in the 1983s and go back to colored linear frameworks on canvas. Pause Meeting (1981 / 1982) is a series of self-"pausing" and thus evolving stories in the form of drawings. These drawings were – together with linear structured paintings – the inspirations and preliminary studies to the color frameworks. This section shows objects made of different materials, which deal with the surrounding spatial environment. The most characteristic feature of this work is the combination of painting and wood object - in some cases even artificial fur or stone. Standing objects (1987 - 1989) lean against the wall like golden skeletons. Some of the artworks show emblematic ladders and monochrome surfaces named after historical locations and events. Titles such as "Carcassonne" or "Béziers in June 1209" are reminiscent of medieval places of the crusaders. Candlelight (1982 - 1983) completes the meditative studies that Iz Maglow had begun with his "Evaporation Installations". These works focus on the reflection of color and light. In some of the installations, it appears that paintings with alternating dark, cold tones and bright warm tones wandered through wall and floor. Everyday finds were used to create Objects from Cultures (1982 - 1992). These painted and partly alienated works of art, in ironic at times, address themes of art history as well as cultural or purely decorative ones. These very early Shoe Relics (1980 - 1981) are art objects in which everyday ways of seeing are reversed in a variety of ways. The alienation of familiar objects allows the viewer a new, artistic "access to the subject of shoes". This presentation dispenses with explanatory words and instead uses matching quotes from Beatles songs. In these very early objects, the artist deals with everyday objects in a very unconventional interpretation. At Tempo (1980 - 1981) Iz Maglow devotes his attention to another everyday object with his objects around the eponymous cellulose cloth. Both the type and quality of the pulp cloth and the ambiguity of the product name employed the artist in these art objects. 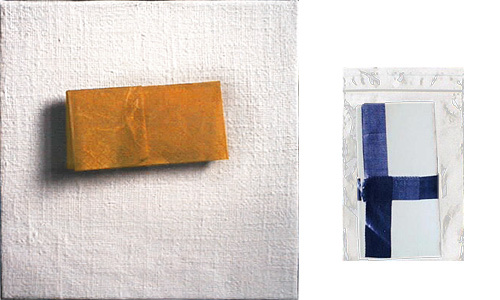 The inevitably small works of art are structured as follows: "Format and Pattern", "Tempo vs. Speed", "Time in Tempo", "Nature and Structure".. It is sometimes overlooked that Iz Maglow created sculptures and works of art in addition to his paintings. These works usually emerge parallel to the paintings, so to speak in an interplay of mutual inspiration. In doing so, Iz Maglow shows that in his sculptural works he wants to implement the subject areas that dominate his painting in a completely different way. This resulted in three-dimensional results that show his engagement with "chairs" and at the same time take up and implement the vis-à-vis topic of the "Holy Annunciation". In addition to free-standing sculptures, the painter also designed colorful and rich in formations of the wall and standing objects leaning against the wall. Other unfamiliar interpretations undoubtedly include his early "Daily Objects" and his ceiling objects. But even in his sculptures on the subject of "Velazquez" he resorts to quite opposite forms of expression, which can sometimes seem strange. If the observer ... "... romantically attuned to a lovely "Maria in the bath" brushing her hair before a cheesy sunset, the completely unromantic "Susanna in the bath" awaits him 'around the corner' – an abstract, black sculpture that has nothing in common with an idyll ...." wrote the Frankfurter Rundschau in 1991 about his sculptures on the occasion of an exhibition in which Iz Maglow's paintings and three-dimensional works of art were juxtaposed. 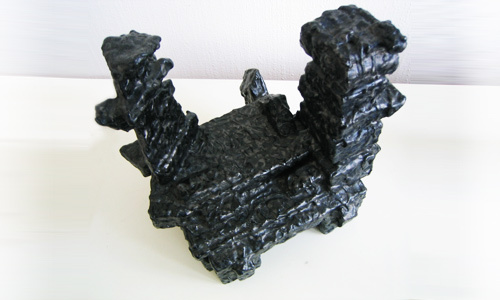 In 1990, the Dutch art magazine t'Circuit quoted the artist as saying about his sculptures with the following words: "... First of all my objects are meant as a cheerful creation. Reflection comes in the second place. ..."